This is the First Cancer Research update from Dr. Steven Curley's research team located at the Baylor College of Medicine in Houston, TX. The research team uses Gold Nano-particles and the Kanzius Radio-wave machine to achieve results that only cause harm to the tumor and not the individual, unlike most other commonly used treatments for cancer. Late last month (September 2014), Dr. Stuart Corr, Assistant Professor of Dr. Steven Curley's Division of Surgical Research, updated the guide on the research that Dr. Steven Curley has been doing with Gold Nano-particles and the Kanzius Radio-wave machine. informed Dr. Corr, that would summarize the information to inform you of their work. I have included for you links to the research, below each summary. Dr. Curley's research team recently conducted two investigations using a common chemotherapy drug called Gemcitabine. The trade name for Gemcitabine is Gemzar. This drug incorporates itself into the cancerous tumor's DNA, causing the tumor to stop replicating. each year, with a high mortality rate. substantial resistance to the drug. In the first study, Dr. Steven Curley's research group used tumor targeted gold nano particles, the kanzius radio-wave frequency system and a common clinically-available chemotherapy drug known as Gemcitabine. the research team administered the kanzius radio-wave frequency system, causing hyperthermia, heating the tumor. The research team found that the experiment was specifically toxic to the tumor while undetectable damage was found to normal cells. The study offered many conclusions. First, their research concluded that by using the combination of gold nano-particles, the radio wave frequency system and Gemcitabine lowered the current relevant dose used for the drug to achieve reduction in tumor size. The study also offered evidence that this drug could be used on stronger forms of cancer, like liver cancer. Furthermore, proving that by using this method of treatment to hepatocellular carcinoma (liver cancer), made the Gemcitabine more potent with lower dosages. addressed the drugs inability to stay effective. It is known in the medical community that after a while an individual has been given Gemcitabine, the drug looses it's potency and becomes ineffective. This allows the tumor to repair the damage that Gemcitabine caused. In this study, they tried four different experiments on a mouse with liver cancer. As the above photo shows, the research team treated the subject (mouse) in the four different experiments over different periods of time. Furthermore, in the gemcitabine and radio-wave (hyperthermia) treated tumor experiment, the team administered the radio-wave system for the last two hours of the gemicitabine treatment. 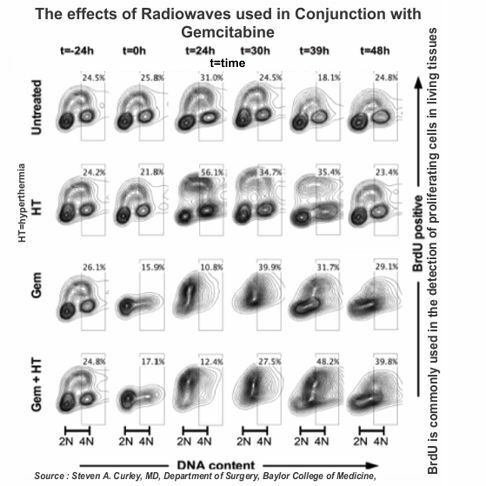 The conclusion of the study found that Dr. Curley's research team were able to demonstrate in this experiment that the radio-wave system knocked out the repair mechanism of the tumor to regenerate, allowing the Gemcitabine to be more effective.